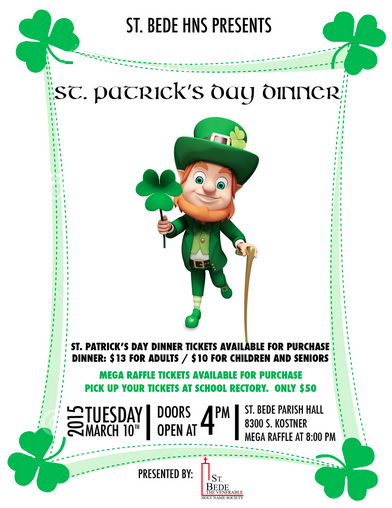 Mark your calendar and makes plans to attend St. Bede Parish's annual St. Patrick's Day Dinner on Tuesday, March 10 in the parish hall at 83rd and Kostner. Mega Raffle winners will be drawn at the event. Only 500 tickets will be sold and can be purchased in the church rectory or the school. Proceeds of this raffle benefit St. Bede's children and the parish.